When Hannah Beachler was tasked with building Black Panther’s environment, she knew it would be a mighty undertaking, one that production designer Beachler “can’t even begin to quantify.” It’s a majestic world, one that thrives in nature and technology. The country is powered by a mysterious metal called Vibranium and is deeply entrenched in the riches of African and African-American culture. It’s a breathtaking futuristic vision that Beachler has created. We caught up to talk about how she worked with Ryan Coolger to build this regal richness from the ground up and how Princess Shuri’s lab was influenced by German elevators. 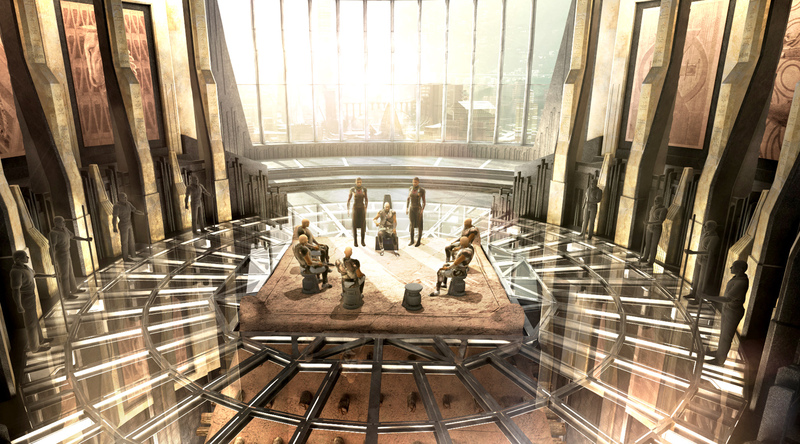 How do you begin to envision the world of Wakanda? The process was really about Ryan guiding all of his department heads through some really profound sea to find a place that is about what it brings to the idea of futurescape, including people and tradition and community. That was the basis for which we began the process of designing Wakanda and just really having it be a lot about the African Diaspora and African-American culture and how that is reconciled with African culture in ancestry and heritage. The general overall idea that we were trying to portray was basically that. It was all wrapped in the fun of the film there, so we took that journey before we could figure out the aesthetics were for a place like Wakanda. Then we went into the next step of how to create a country that feels like it’s been there for thousands of years. How did you find the balance of future and this world? It was always about being thoughtful about how you view technology. It’s a real issue. How far do we go? When do we stop connecting with people? What are the potentials and what are the dangers of it? To balance it, we thought of it as one ecology and one environment. The technology was there to perpetuate a way of life and that’s why it feels traditional. Not necessarily to perpetuate life itself to keep you breathing. It wasn’t Wall-E. We wanted to make sure we were continuing to pull the human aspect of it. technology became this idea of how do we solve problems. That hoverbus. That bus in many countries in Africa, specifically where Ryan and I were in South Africa, Ryan saw a bus and thought it was cool because it’s the main method of transportation. He wanted that in the film. So, we had to think of how would this have evolved in a country that is so advanced? You take the tro-tro that is all over Africa. People go to work in it. The thought pattern was the environment was that the nature of Wakanda has to blend with the technology, so how would they have taken this bus and before anyone in the Western world did it, how would they use vibranium to take away pollution and emissions of gas? what would they have done so they could keep the environment and nourish it rather than destroy it? It doesn’t have toxins or emissions. We changed the narrative of what people think about the bus? If the bus is something that is part of their lives, they just evolve it. We took this idea of humanity and put it in the world where the first thought is the earth and tradition. It’s a really existential way of looking at it. It offers the idea that this county in a continent like Africa, is like how a place could be. Wakanda has their own agency. Everything they’ve made or designed has been by themselves. It’s not been influenced by the western world. It’s not had its standards decided by the Western World. Everything in that country is from the people and that’s the gift that you give back to the African culture and the African-American culture. So, all of the things that had been taken over 400+ years, you give back this idea. Let’s talk about creating a few sets. 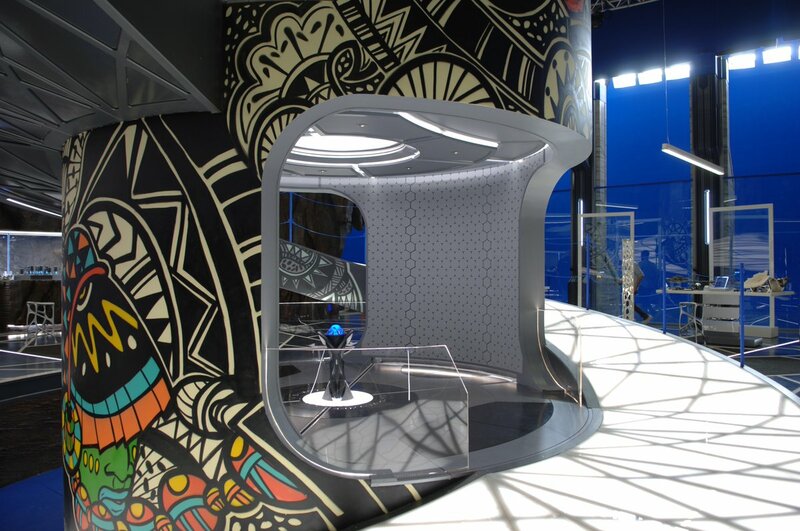 Take us through creating Princess Shuri’s lab. I love that set, it’s one of my favorites. It was towards the end of the schedule so we had a lot of time with it. I was talking to someone and we came up with the idea of elevators. We were talking about elevators in Germany and my friend talked about some of the elevators there where you set on the platforms and you go up. It’s just a platform with no doors, you step on it and it goes. I thought that would be interesting. I thought wouldn’t it be good to have in the lab? What if that’s how you work something out in the lab? So, the idea came from a German elevator. How would they have mined vibranium a long time ago? They would have stopped because they would have evolved that process with their technology. They don’t just throw things away. That middle core would have been a drill, she painted it and there’s life in it. She can see out over the whole vibranium mine and she has a landing pad where she can bring her dragon flyer in. We wanted it to be inside of the rock. There are a lot of stories behind the sand and the technology of the sand. That’s where we started, why was it there? It was all about not being wasteful and being mindful of the ecology of things. They don’t have to go bigger and better, let’s repurpose it. I also loved the throne room. What inspired that look? We went through many iterations of the throne room. The throne room was something we wanted to be big and regal. The circle is a theme throughout the film. Ryan wanted it to be close to something that was close to them traditionally. Something that had a lot of history where they would make all the business decisions for the country. The chairs were influenced by ideas from Mali, Timbuktu. The story goes back to history and you have to go there. When Bashenga united them and became the first panther and king of Wakanda, that was where all the decisions were made. As time goes by, they built around it in honor of that. So, it’s still this important place where they make decisions. There’s clear glass so you can see the whole Timbucktu pyramid, you can see through and see down to that. That’s where we went with that. We wanted something grand, but something that still felt good. The room is pretty much made of vibranium and glass, but it has that earth touch that makes it of the earth.